Guild Wars 2 is still the most interesting game in September due to its transition to F2P. This resulted in significant rise in gold price. WildStar, on the other hand, did not get that much hype after it turned into F2P. While GW2 enjoyed its rise in price, FFXIV had more than 20% drop in its currency price. World of Warcraft US gold market was quite fluctuating this month and it could keep being like this until November. The release of ArcheAge 2.0 Heroes Awaken on September 12 did not impact ArcheAge gold price at all, as predicted by our August 2015 price monthly summary. There was only a slight increase in price on the last week of September but it has rapidly returned to its normal state. This could be a sign that ArcheAge is continuously losing its popularity. ArcheAge price should be lower in October. The cheapest was on September 23, 2015 which is 2,000 ArcheAge gold for $42.10 and the most expensive was on September 28, 2015 for $50.00. It was 18.76% different. EVE Online ISK September price was slightly higher than August but the number was not significant at all. Except for the first week, EVE Online ISK stayed in the range of ~$41 USD for the whole month and it is expected to stay in this range until the release of Fall update with the Crimson Harvest. The cheapest was on September 23, 2015 which is 2bn EVE ISK for $40.74 and the most expensive was on September 4, 2015 for $43.42 USD. It was only 6.58% different. FFXIV Gil August price was lower than in July, as predicted by our last month price summary although the difference in rate was not that huge. Gil price was lightly fluctuating on the 3rd week because of the 2-year anniversary celebration, the Rising Event. Since it did only provide the magical moment and not offer any special items, Gil price slowly decreased after the event announcement on August 24, 2015. Final Fantasy XIV Gil should, again, be on a slight decrease in September. The cheapest was on August 18, 2015 which is 5m FFXIV gil for $26.05 and the most expensive was on August 24, 2015 for $28.57. It was 9.67% different. The effect of the Heavenwards' release has now ceased in September. 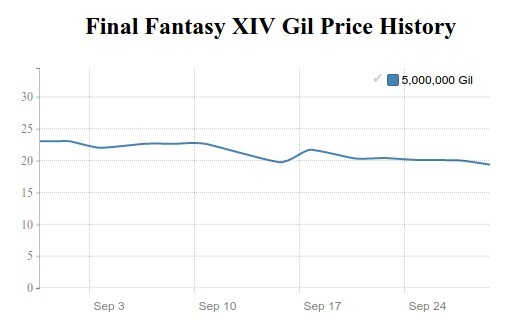 The FFXIV Gil was on the downfall since the beginning of the month and has now returned to the original state of ~$21 USD per 5m Gil, which was the Gil price before Heavenwards. Final Fantasy XIV Gil price should stay in this range for the whole month. The cheapest was on September 30, 2015 which is 5m FFXIV gil for $20.72 and the most expensive was on September 4, 2015 for $26.67. It was 28.72% different. 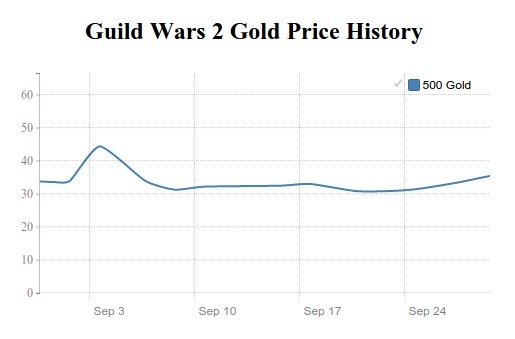 With the huge announcement of GW2 going F2P on August 29, 2015, its gold price was, once again, on an immediate 30% increase a few days after that. Sadly, it lasted only for a few days before it decreased to ~$31 USD per 500 Guild Wars 2 gold but it kept fluctuating for the whole month. With the coming Heart of Thorns on October 23, 2015, GW2 price should again enjoy its rise until early 2016. The cheapest was on September 23, 2015 which is 500 GW2 gold for $30.77 and the most expensive was on September 4, 2015 for $44.96. The discrepancy was as high as 46.12%. SWTOR US Credits September price was slightly lower than the previous month. A sudden 10% rise on September 4, 2015 was a result from game update 4.0 class changes. However, this increase only lasted for a single day before its gradual decrease until it reached $32 USD per 10mn SWTOR Credits on the beginning of the 3rd week. Then, its price stayed in this range until the end of the month and it's expected to stay the same in October. The cheapest was on September 23, 2015 which is 10mn SWTOR US Credits for $32.40 and the most expensive was on September 04, 2015 for $39.83. It was 22.93% different. Great costume always works well with F2P game and it's no different in Tera online. After TERA gold price had been gradually decreased since July, it just came to an end with the introduction of new costumes by the New season event at the end of September. However, this should only be a temporary stop. Tera Gold prices should start falling again in the middle of October. The cheapest was on September 16, 2015 which is 20,000 Tera Gold for $25.98 and the most expensive was on September 30, 2015 for $27.96. It was 7.62% different. WildStar Online completely turn into free-to-play with an expected increase in its gold price but it was not that major. The rise in price should be significant during the first half of October and a slow decrease after that. However, Wildstar gold price should stay in the range of ~$55 USD per 5,000 gold until early 2016. The cheapest was on September 04, 2015 which is 5,000 gold for $50.04 and the most expensive was on September 18, 2015 for $54.95. It was 9.72% different. World of Warcraft US Gold during September was quite fluctuating. It was decreasing for the first two weeks before a sudden increase on the third week. This rise lasted for 2 weeks before returning to its original price at the end of September. Blizzard is going to have Blizcon 2015 in the beginning of November 2015. This will keep the WoW gold price fluctuating for the whole October. If there is major news to be accounted from the annual event, be prepare for a rise in WoW Gold price again. The cheapest was on September 30, 2015 which is 50,000 gold for $20.39 and the most expensive was on September 21, 2015 for $24.95. It was as high as 22.36% different.